Michael and I just ran a marathon over the last 5 months. We started traveling in mid-march and I kid you not, tomorrow will be the first week I will not have to leave my house since. You think you love traveling until you find yourself scared to death to fly and someone throws in 2 unexpected moves in the middle of your jam-packed schedule. NOT. MY. BEST. MOMENTS. Let me just reiterate the most important part of this whole thing. I just traveled for 5 months straight and I am terrified to fly. Not just like, I’m scared. Like, I cry like I am facing certain death. Sweaty palms, my heart beating so loud you can hear it all the way in the tiny, tiny toilet stall, tears uncontrollably streaming down my face, shaking. I am awesome on a plane. Imagine how excited Mr. Moreno is to jump on a flight with me. Poor dude. 36 flights. I’m doing it anyway. Working seriously hard to get through it. In the last 5 months Mr. Moreno and I have seriously hustled our butts off. Flying all over the world. Not a ton of working on the computer; a bunch of working with people. I have seen thousands of the people I work with online since March. It’s been totally worth it. 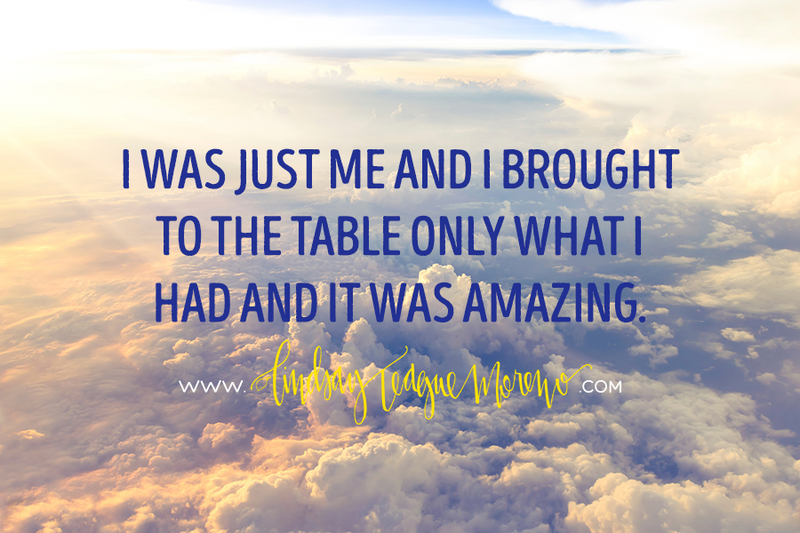 I let the blog take the back seat, I let a lot of work stuff take a back seat, I even let time with my kids take a back seat. I learned about how big this business is getting; how many people it is touching. I learned how to spread out the work. I learned how to work though some hard stuff with my husband as we hit a rough few weeks though the stress and constant business. If you don’t know my background, a little over 2 years ago, I founded a team of Young Living members called The Lemon Droppers. It has grown fast and furious and I’ve spent most of my time sitting in front of a computer creating and teaching and typing. You wanna know a secret? I have no idea what I’m doing. I’m learning absolutely everything about my job as I go. I have experience but not to this extent. I just have to trust my instincts and do what I think is best for my peeps. I’m making plenty of mistakes and I’m doing something right, it seems. This last 6 months my focus was people. Seeing people. Hugging people. Connecting with people. Being who I genuinely am and letting people see that. The good and the bad. I’m not covering up the blemishes; people learn from that. They connect to me by relating to the rough stuff. They’ve been there too. I don’t know what it is that you do but with this lesson, I don’t think it matters. It’s applicable to absolutely every interaction you have with another human. Are you being truly vulnerable? Are you showing people who you are? Are you being genuinely you? Are you too afraid to let people see the chinks in your armor? Are you pretending? I’m so tired of trying to build relationships with people that are pretending. I’m so tired of this idea that to lead someone you have to be practically perfect; you have to know it all. It’s false. This past 5 months, I was just me and I brought to the table only what I have and it was amazing. As someone who prefers small groups of close friends, I have grown so much through it. Being with my people has been amazing. I’m ready for some time with my family at home before we go into the fall and hit up 3 cities for the FUEL Life on Fire tour. I’m ready to be back to blogging and creating and thinking into the future. It’s time to get back to my regularly scheduled programming. Blessed to be a part of something so amazing. I seriously look at you in awe of all that you’ve done. Xo love you!! A huge part of what makes me feel at home within the Lemon Droppers is the realness of the women, the BossBabes. That all starts with you Lindsay, and I know I speak for many of us when I express my heartfelt thank you for giving us a home we can call work. You know when I first started this journey it was about being healthy. I was tired of being sick! But it has grown to be oh so much more! I have met wonderful people! I also have grown to step more out of my box. i love your vulnerability which I need to learn to do more of. I’m usually the swan on the pond flowing gracefully and cool across the lake but underneath the water my legs are paddling like crazy!!! You did great your people skills! Thanks for this. I am usually not a “bandwagon” type person. As a matter of fact, I avoid the bandwagon like it is full of something AWFUL. Your words and your journey inspire me. Weird, because I am pretty hard to inspire. I HATE sales – especially direct sales. I LOVE helping, though. I want to do this business so badly. I surprise myself every day. Heck…I am just beginning. I don’t even have ANY business people yet, but I am so fired up. I can’t stop thinking about how these oils are helping me when NOTHING else I tried did (and believe me, I tried everything). I want so badly to help everyone I know. I am not sure if I can do it, but I am sure trying. I appreciate the vulnerability. I am vulnerable about 300 times a day. It is nice to know I am in good company! Love being one of the people you touched. This has motivated me to stay true to myself. I feel the growth and I love your example. Two fist bumps and a double arm pump! Go’head on girlfriend!!! We gotcha back. You’re amazing and I can’t wait until the day I get to give you a hug. Enjoy some down time, girl! You’re impacting me and speaking my language. Like you eerily sit perched in my brain. Can’t wait for FUEL Orlando. Thanks for being perfectly imperfect and leading with strengths and weaknesses. I need it and appreciate it. I’m thankful being introduced to YL introduced me to you. Even though I don’t think we are part of the same “team” anymore I’ve watched you and been amazed at how your have truly opened yourself up this last year. I’m honored to know you and to be inspired by your freedom, your fierceness, and your vulnerability. Even though our paths have only crossed in person once – I consider you a long distance friend – someone I pray for and I know would pray for me if I asked. Thanks for owning the person God created you to be. That’s something most of us struggle to be and yet that’s where we find our “sweet spot” and the ability to walk in His will for our lives. Thank you for your leadership, and for being you! I watched you at session a and online at session b and wondered how you kept spreading the love and light day after day. I sure hope you take some time to recharge and refresh. Hug your babies…their love is like magic pixie dust! You are so much more than enough. You are amazing. I appreciate you right back. Thank you for making time for us! It is always good seeing you! You are always genuine and caring! Now take some time for those beautiful girls! We’ll see you in Scottsdale! Thank you! It is my pleasure! Can’t wait for Scottsdale!!!! I love you. Like I told you last night, you being you blessed A TON of people. Thank you Tammy! Love you back!!!! You inspire me each and every day!!! Keep being you because who you are is AWESOME! !